DECEMBER 2017 UPDATE: So with being in the shop all the time, it’s been very difficult to properly focus on reformulating. So, we have made the decision to close the shop mid-December and relocate to the Blue Mountains. The ABSOLUTE TOP PRIORITY in the New Year once we settle in is to get the Balm happening again, come hell or high water! "Having tattooed for well over 20 years, I have always searched for the best products to use on my clients. Tattoo Balm is one of the best things I have come across to not only make the tattoo process better, but to aid in my clients' skin healing. Being all natural, it is by far a better and safer alternative to traditional vaseline and petroleum jelly... check it out and you'll see for yourself what I mean." 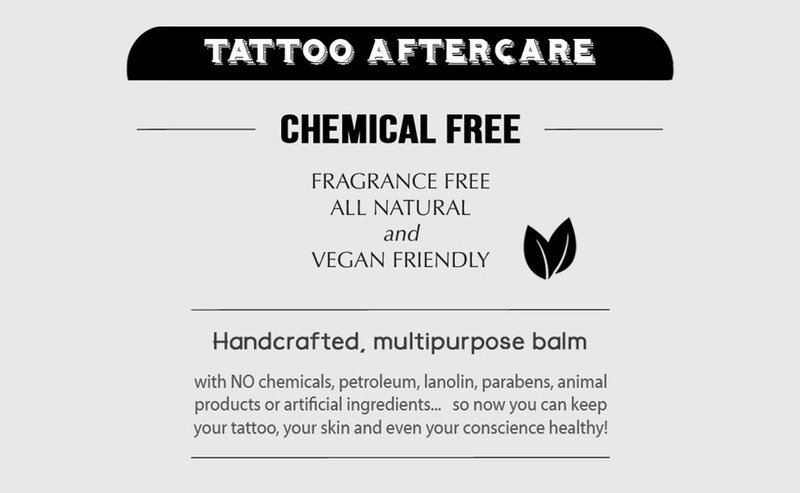 Tattoo Aftercare that is chemical free, fragrance free, all natural and vegan friendly. Our handcrafted, multipurpose balm has NO chemicals, petroleum, lanolin, parabens, animal products or artifical ingredients… so now you can keep your tattoo, your skin and even your conscience healthy! Not tested on animals. Great for sensitive skin.